Scroll down to see the top not-for-profit colleges offering hospitality management degrees online. Albany Technical College offers an Associate of Applied Science in Hotel/Restaurant/Tourism Management and a diploma program in the same subject. Both can be taken completely online except for the internship. Students seeking the associate degree must complete 60 credits of coursework, including 15 credits in general studies courses and 45 credits in required courses and electives in the hospitality major. Required classes include hotel operations management, event planning, food and beverage management, and an internship. Students in the diploma program complete 44 credit hours, with only 8 credits required in general studies courses and 36 credits in hospitality classes. California State University East Bay offers an online option leading to a Bachelor of Science in Hospitality and Tourism. Courses in the program cover topics such as restaurants and food service, special events and meeting planning, and hotel and resort management. The fully online program is a degree completion program and includes only the upper level classes required for the degree. Students should have completed the required lower division General Education courses before entering the program, such as by attending a community college or by taking online courses available through the California Virtual Campus. To transfer into CSUEB, students must have completed at least 60 transferable semester units and have a GPA of at least 2.0. Students seeking an Associate of Applied Science in Hospitality Management from Central Texas College may earn a specialization in Hotel Management or in Food and Beverage Management through a completely online option. Each program takes four semesters of full-time study, and students must complete 60 credits to graduate. Students in both the specializations are required to work an internship to gain real-world experience. Both programs include coursework in topics such as hospitality financial management, hospitality legal issues, hospitality supervision, and purchasing for hospitality operations. CTC also has a fully online one-year certificate in Food and Beverage Management that requires students to complete 29 credits. Charleston Southern University offers an online Bachelor of Science in Organizational Management with a track in Hospitality and Tourism. Depending upon how many credits they transfer to CSU, students can complete the program in as little as a year. The accelerated program is designed for working professionals, so online classes do not require students to log in at a specific time. Courses are delivered in a seven-week term, with six terms per year. Students can take up to three courses per term. The curriculum includes courses in organizational behavior for the hospitality industry, marketing for the industry, planning and developing tourism, economics of tourism, and a class that examines case studies from the tourism and hospitality industry. Chemeketa Community College offers an Associate of Applied Science in Hospitality Management that is available in a completely online format. Students who want a shorter program can earn a certificate in Event Management or Hospitality Management, which are also offered in a 100 percent online format. The programs are designed to prepare graduates for an entry-level management job in the hospitality industry. To earn the A.A.S., students must complete 92 credit hours, including general studies requirements and hospitality management classes. Courses in the major include computer reservation systems, special events planning, customer service management, catering operations, and resort management. Students have the option to perform a practicum in tourism or hospitality management. Cincinnati State Technical and Community College offers an Associate of Applied Science in Hospitality Management program that is available completely online. Graduates of the program are qualified to enter the Bachelor of Science in Hospitality Management program at the University of Cincinnati. The program combines classroom instruction with co-operative education so students gain real-world experience in the hospitality industry. Co-op employers for the program include Hilton, Hyatt, and Marriot Hotels, and the Cincinnati Country Club. Students are required to complete two full-time, semester-long, paid co-op assignments while earning their degree. The program requires students to earn 64 credits and will take students six semesters - four semesters of coursework and two co-op semesters. Coastal Carolina University, whose campus is just a few miles from the resort area of Myrtle Beach, South Carolina, has an online program leading to a Bachelor of Science in Business Administration with a major in Hospitality, Resort and Tourism Management. This program requires students to complete an internship, which students can complete near their home or in an area of their choice, including in Myrtle Beach. In addition to selecting the geographic area for their internship, students can choose whether to intern in guest service production, guest service delivery, or management training. Coastal Carolina University was ranked second in Best Value Schools and tied for 19 in Top Public Schools in the 2018 rankings from U.S. News. CSN offers online programs leading to a Certificate in Hotel Management or Food and Beverage Management. The Hotel Management program prepares students for entry-level jobs or gives them skills to advance their career. The 31-credit program can be completed in two semesters of full-time attendance and covers topics such as front-office operations, hospitality industry computer applications, hotel and gaming law, and hospitality service management. The 32-credit Food Service program includes courses in basic cookery, hospitality purchasing, restaurant management, nutrition, menu planning, and catering management. Some courses for the Associate of Applied Science in Hotel Management may be available online, but the degree is not offered as an online program. Students seeking a career in resort management can earn a Hospitality Operations Certificate completely online in as little as one year at Colorado Mountain College. The faculty for this program is based at the college's campus in the resort area of Steamboat Springs, Colorado, where students may also take courses. The certificate program requires students to complete eight courses and a work experience for academic credit. Students who complete this certificate have the skills needed for an entry-level supervisory job in the hospitality industry. Credits earned for this certificate can be applied toward a two-year Associate of Applied Science in Resort Management program available through Colorado Mountain College. Students who already have an associate degree can complete a Bachelor of Science in Hospitality Management online through East Carolina University. Three concentrations are offered: conventions and special events, food and beverage, or lodging. This is a degree-completion program that requires all hospitality majors to complete an internship and an externship. Graduate students can also earn a certificate in hospitality management through online coursework. The certificate can be an optional add-on to ECU's MBA program, which is offered online, or can be taken by students who are enrolled in an AACSB-accredited school or who have already received an MBA from such a school. The certificate requires four courses. The Virtual College at Fort Hays State University offers a fully online program leading to a Bachelor of Science in Tourism and Hospitality Management. Students in the program can choose from three concentrations: hospitality operations, event management, or wellness facilities operations. Hospitality majors must complete 24 credits in business core classes, 21 credits in major core classes, and 12 credits in the concentration, as well as general education requirements. Core classes in the major cover topics such as tourism and hospitality, service operations, management information systems, and international hospitality. Students also have an industry internship. The Virtual College also offers several certificates in tourism and hospitality, with online programs leading to certificates in Tourism and Hospitality Leadership, Management, or Marketing. Holyoke Community College offers three programs in hospitality management that can be completed fully or partially online. The Hospitality Management Transfer Option results in an Associate of Science in Hospitality Management and prepares students to transfer into the Hospitality and Tourism program at the University of Massachusetts Amherst as a junior. The Hospitality Career Option, which includes a co-op element so students gain real-world experience, also results in an A.S. in Hospitality Management. Up to 80 percent of the coursework for either A.S. option can be completed online. HCC's Hospitality Management Certificate can be completed completely online. Students in the 25-credit certificate program take courses covering basic business topics. Students interested in hospitality and tourism management can find several relevant online programs at IUPUI. The university offers four undergraduate certificate programs, each requiring 18 or 19 credits, in various aspects of the tourism industry. Undergraduate certificates are offered in sports tourism development, tourism planning and development, cultural heritage tourism, and events management. At the graduate level, IUPUI offers a Master of Science in Recreation with a major in recreation administration designed for individuals who want an administrative job in the recreation industry, such as with a park and recreation agency, campus recreation program, or park administrative office. This is a 35-credit program with a capstone that requires studying a practical problem or completing an internship. Iowa State University has Ph.D. in Foodservice and Lodging Management that uses a hybrid delivery system. For the Distance Doctor of Philosophy program, students take online courses in the fall and spring semesters and attend two summer sessions, lasting about three weeks each, that are held on campus. This program is for industry professionals who want an advanced degree. This is a 72-credit program, with up to 30 credits accepted from a master's program. At least 24 credits must be completed through Iowa State. Applicants must submit GRE scores, resume, three recommendations, goals statement, and transcripts. Johnson and Wales University has four online degrees specifically focused on hospitality management. The Bachelor of Science in Hospitality Management is for individuals who are already working in the hospitality industry and need management skills to advance their career. The Bachelor of Science in Hotel and Lodging Management is for students with at least two years of full-time work experience. The Master of Science in Hospitality Management covers all aspects of the industry and allows students to customize the degree through electives. The MBA in Hospitality is an industry-specific MBA program. All programs are 100 percent online with 11-week courses. Students can earn the MS in as few as 15 months and the MBA in as few as 18 months. Madison Area Technical College offers an Associate in Applied Science in Hospitality Management that students can complete in four semesters of online classwork plus a summer internship. Part-time students are also welcome. Students who receive the associate degree are prepared to enter the workforce or to transfer to a four-year school to earn a bachelor's degree. The college has an agreement with the University of Wisconsin-Stout that allows students to apply hospitality management credits toward the bachelor's in hospitality and tourism management. MATC students can earn up to 12 credits while working at Walt Disney World and participating in the Disney World College Program. Missouri State University has an online Bachelor of Applied Science in Hospitality Leadership that is designed for students who already have an Associate of Applied Science in hospitality or culinary arts. Students in this program take business courses related to the hospitality industry, complete a capstone, and work a paid internship for at least 750 hours. For many students, the internship leads to long-term employment. For individuals who are already working in the industry and want to move up to mid- or upper-level management positions, the university has an online Hospitality Administration Graduate Certificate. Students in this 12-credit program take three classes and complete a field experience course in hospitality administration. NHTI has an Associate of Science in Hospitality and Tourism Management that is offered 100 percent online. The program can be completed in four semesters of full-time attendance, with students earning about 65 credits. By taking specific electives, students are able to complete a certificate in Hotel Administration, Event/Conference Management, Travel and Tourism, or Wedding Planning Management as part of their degree work. Students in the major have an internship of at least 90 hours of work with a hospitality employer. Students who complete the associate degree can take advantage of NHTI's transfer agreements to enter Plymouth State University's Bachelor of Arts in Tourism Management and Policy program or a program at New England College. North Carolina Central University offers an online program leading to a Bachelor of Science in Hospitality and Tourism Administration. The program may require students to take some face-to-face courses, and students are also required to have field experience and an internship in the hospitality industry. Students are expected to gain 500 hours of field experience in the industry over the two summers between their freshman and junior years. The summer between their junior and senior year, they must work a 500-hour internship in the hospitality industry. To earn the degree, students must complete at least 58 credits in hospitality and tourism classes. The program is housed in the school of business. Northern Arizona University offers an online option for its Bachelor of Science in Hotel and Restaurant Management. Content covers topics such as front of the house operations, commercial food principles, managing food and beverage operations, managing facilities, and hospitality law. The program requires students to complete 73 credits in the major, including 46 core classes in hospitality administration, 15 credits in required business classes, and 12 credits in a concentration. Students in the program are required to complete two semesters of a modern language and they have the option to do an internship. The program is accredited by the by the Accreditation Commission for Programs in Hospitality Administration. Robert Morris University has an online Bachelor of Science in Business Administration with a major in hospitality and tourism management that is for working professionals. Students must take 42 credits in RMU general education courses, 30 credits in business foundation courses, 21 credits in the major, and 12 credits in business electives. Students have the option of performing an internship for credit. All online students are assigned a student services representative to act as a coach and mentor while they work on their degree. In 2017, the college was on the U.S. News & World Report list of Best Online Bachelor's programs. The Heller College of Business at Roosevelt University offers a fully online Executive Master of Hospitality and Tourism Management degree that is designed to fit the schedule of busy professionals who need to work and travel while studying. Candidates can earn the degree in one year, and Roosevelt has five start dates available each year. This is the only program of its kind offered in the Chicago area. The curriculum includes a focus on seven key areas important to hospitality managers, including marketing, financial analysis, and training and development. This program does not require applicants to submit GMAT or GRE scores, but international students must prove English language proficiency. Students in the hospitality program at St. Leo University work an internship for six to 12 credits, and they are allowed to find an internship anywhere in the world. Because the university is close to Orlando, many students intern for organizations such as Walt Disney World or Sea World. Some internships include a stipend or other compensation. To earn the Bachelor of Arts in International Tourism and Hospitality Management, students specialize in either international tourism or hospitality management. Students have the chance to network with industry professionals through the Industry Liaison Council, an advisory board to the hospitality program. Hospitality majors also get to attend hospitality trade shows. The University of Alabama School of Hospitality and Hotel Management was ranked No. 18 in the world by CEO World magazine. The school delivers the content for the Bachelor of Science in Hospitality Management online through UA's Bama By Distance program. Students must complete 120 credits and perform an internship or practicum with an approved hospitality organization, which are located around the world. The curriculum includes 49 credits in hospitality management coursework. The program is open to new students and transfer students. Applicants must submit transcripts from any previous colleges attended and high school transcripts if they have fewer than 24 college credits. With or without the optional thesis, the MS in Hospitality and Tourism Management at UCF is a 33-credit program with six core courses in management, finances, marketing, analysis, and strategy. That last area is the focus of the capstone. The non-thesis option allows for five electives; the thesis option accommodates just two. Applicants without a bachelor's degree in the field can still gain entry, but will must take three to six undergraduate courses, depending upon professional experience. Because Hospitality Management is an online minor at UCF, grad students can easily check off some of these prerequisites. Because all courses are available both online and on-campus, admitted grad students can craft a hybrid degree. As a degree completion program, the online Hospitality & Tourism Management baccalaureate at UMASS only accepts students with at least 27 undergraduate credits to their name. The BS gives students a broad sampling of business topics - introductory courses in accounting, finance, marketing and statistics are all required - in addition to 34 credits in the major. There, students will learn about operations, law and human resources and then cap it off with a service experience. Undergrads most interested in the elective courses might choose to earn certificates in Meeting & Event Management or Casino Management. Both are 15-credit curricula. The William F. Harrah College of Hotel Administration at the University of Nevada Las Vegas offers an online Master of Hospitality Administration that students can complete in as little as one year, although most students complete it in 18 to 24 months. Students are required to complete 10 courses, including five required courses and four electives. Requirements also include a capstone professional paper on an issue facing the student's company or an entrepreneurship class. Courses are offered in five eight-week sessions during the year, and students may enter the program at the start of any session. There are no requirements to visit campus. Applicants should have at least three years of industry experience at the management level. The University of New Orleans offers a completely online Executive Master of Science in Hospitality and Tourism Management for students with professional experience in the industry. The program has five eight-week sessions per year, and student can complete the degree in one year by taking two classes per session. All 10 classes focus on the hospitality industry and cover topics such as marketing applications, finance and revenue management, tourism destination development, technology for the industry, operations analysis, and strategic management. Applicants should have three years of full-time work experience in a supervisory position in the industry, although applicants with hospitality experience at a non-supervisory level may be considered with a 3.0 minimum undergraduate GPA. The University of North Texas offers an online Master of Science in Hospitality Management that allows students to select either a thesis or non-thesis option. The 36-credit program requires students to complete 15 to 18 credits of required research courses and capstone projects and 15 to 18 credits in content courses, which include choices such as global tourism, service excellence, cost controls, event management, and IT strategies for the industry. Applicants to the program must have a minimum undergraduate GPA of 2.8. Applicants who have not taken specific undergraduate courses in hospitality management may be required to take leveling courses. Students may be able to transfer up to 12 credits in related coursework. The University of the Southwest offers an online program leading to a Bachelor of Business Administration with a major in Hospitality Management. Students in the program are required to take 30 credits in core business classes and another 30 credits in the hospitality major, along with general studies courses and electives resulting in a total of 120 credits to graduate. Courses for the major cover topics such as food service management, service marketing, and hospitality industry financial management. Students can access classes at the time of their choosing and communicate with classmates and professors online. USW does not charge out-of-state tuition or technology fees for online classes. CEOWORLD Magazine ranked the Stout School of Hospitality Leadership the eighth best hospitality management school in the world in 2017. There, online students can choose between two programs: a BS in Hotel, Restaurant and Tourism Management and a BS in Golf Enterprise Management (GEM). The latter, which incorporates hospitality alongside turf-related issues, is the only such degree in the country. Students in the former, meanwhile, spend a full 25 percent of their four years in operations management classes. Financial and revenue management courses and organizational management classes round out the requirements. Upperclassmen must take 2 to 14 credits' worth of internships, sprinkling in up to four elective courses, including options from the GEM program. With so many online programs in hospitality management out there, how can you choose the right one? By hanging out with us! In this handy guide, you’ll find tips on matching the program to your goals (e.g. AAS vs. undergraduate certificate), transferring credits, evaluating internships, taking advantage of tuition breaks, and more. We also have helpful summaries of the top online schools in our rankings for both quality and price. 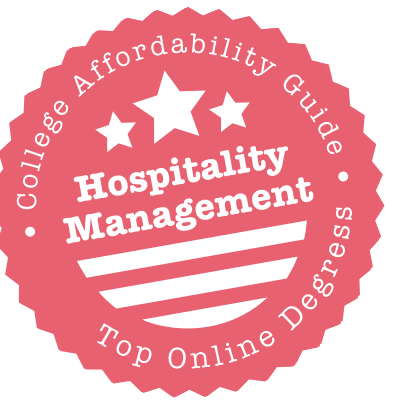 If you’re still on the fence about distance learning, have a quick look at our rankings of Affordable Hospitality Management Degrees. In addition to highlighting low-cost and regionally accredited options in your state, we go into a bit more detail about degree titles & job prospects. What Do You Want the Online Degree For? You may not need a degree for entry-level work in the hospitality industry–a number of professionals like to start with a high school diploma and gain managerial and administrative experience on-the-job. But an educational qualification can go a long way to improving your job prospects in front-line positions. Plus you can work part-time while you study for the online degree. Should You Opt for an Online AAS or an AS? The AAS is the most popular option in hospitality management, especially at the community college level. Traditionally, it’s a degree that prepares you for entry-level work immediately after graduation, but a lot of schools are willing to accept AAS credits if you decide to transfer them to a bachelor’s degree in the future. AS degrees are often used for transfer, but there are exceptions. For instance, Holyoke Community College offers an Online AS in Hospitality Management with a Transfer Option and a job-focused Career Option. Can You Specialize at This Level? Yep! A number of AAS programs will allow you to focus on your career interests. For example, Central Texas College has an Online AAS in Hospitality Management with online specializations in Hotel Management or Food and Beverage Management. That means you can choose courses that might apply to your current job (e.g. front office procedures, dining room service, etc.). Is There an Internship or Co-Op Program? Almost always, so be prepared for on-the-ground work. The good news is that a number of hospitality schools have special arrangements with hotels and employers. For example, co-op sponsors for Cincinnati State Technical and Community College’s Online AAS in Hospitality Management include Hilton, Hyatt, and Marriot Hotels, and the Cincinnati Country Club. AAS students in this program complete two semester-long, paid co-op assignments while earning their degree. Can You Transfer Your Online Credits to a Bachelor’s Program? Although you may not want a bachelor’s degree now, it’s nice to leave the door open for the future! If you attend a regionally accredited school, it should be relatively simple to transfer your associate credits, but you can always check with the bachelor’s program ahead of time. Some schools have special transfer arrangements. For instance, students who complete the Online AS in Hospitality and Tourism Management at NHTI-Concord Community College can take advantage of NHTI’s transfer agreements to enter Plymouth State University’s BA in Tourism Management and Policy or a program at New England College. What Do You Want the Online Degree For? If you’re aiming for a supervisory position in hospitality management, you may find that a number of full-service hotel chains prefer managerial candidates to hold a bachelor’s degree in hospitality or hospitality management. Provided it’s a strong program, an online degree from a regionally accredited school will be just as acceptable as on-campus one. Can You Choose a Concentration? In many cases, yes! If you’re currently working in the industry, you may wish to target online electives that have direct applications to your job. Choosing the right concentration can also improve your chances of promotion. For instance, Fort Hays State University offers an Online BS in Tourism and Hospitality Management with three concentrations: hospitality operations, event management, or wellness facilities operations. Does the Online Program Have Unique Strengths? Even if you’re studying online, you may find that your School of Hospitality offers unique opportunities to its students. Often this comes down to the school’s location. For example, the campus at Coastal Carolina University is just a few miles from the resort area of Myrtle Beach, and a number of CCU students decide to complete their internship in the resort area. Meanwhile, students at Saint Leo University in Orlando have the chance to network with Industry Liaison Council professionals and often end up working at local organizations such as Walt Disney World or Sea World. Is There An Internship? Like AAS programs, online bachelor programs in hospitality almost always include a mandatory internship. It’s intended to give undergraduates practical experience in hotels, resorts, or hospitality settings. You may also see this called a practicum, co-op program, externship, or fieldwork. What is a Hybrid or Blended Program? A hybrid or blended program means that you will need to complete some of your courses on the actual campus. For instance, North Carolina Central University’s BS in Hospitality and Tourism Administration is predominantly online, but the program may require students to take a few face-to-face classes. You may also discover that certain concentrations or specializations are only offered on-campus. Examine the curriculum carefully. What is an Online Degree Completion Program? To apply for a degree completion program, you must have an associate’s degree or a certain number of undergraduate credits in first-year and second-year courses. For example, applicants to California State University East Bay’s Online BS in Hospitality and Tourism are expected to have completed 60 semester units of General Education courses before they can enter the program. Meanwhile, Missouri State University’s Online BAS in Hospitality Leadership is designed for students who already have an AAS in Hospitality or Culinary Arts. How Easy is It to Transfer Credits into the Program? This is especially important if you have already earned an undergraduate certificate in hospitality! You don’t want to repeat classes you’ve already taken. Read the university’s credit transfer policy to see if your previous undergraduate academic coursework, your work experience, certifications, and/or military service can be applied for credit to the online bachelor’s program. The more credits you can transfer, the lower your final tuition costs will be. Do the Admission Requirements Include Work Experience? If it’s a management-focused program, some schools may want to see a few years of experience on your résumé before they’ll accept you. For instance, Johnson and Wales University’s Online BS in Hospitality Management is built for individuals who are already working in the hospitality industry. And its Online BS in Hotel and Lodging Management is for students with at least two years of full-time work experience. What Do You Want the Online Degree For? Folks often pursue an online master’s degree in hospitality management in order to qualify for executive management positions (e.g. corporate director, hotel manager, etc.) or to prepare themselves for entrepreneurial ventures (e.g. running their own hotel). If you have these goals in mind, look for programs that include relevant work experience (e.g. internships, group collaborations, capstone projects, etc.). Should You Choose an Online MBA or an Online MS? There is a difference. An Online MBA will have a set of standard business courses at its heart (e.g. corporate financial accounting, operations management, strategic marketing, etc.). An Online MS in Hospitality Management will often include more industry-focused classes in the core (e.g. global tourism). Some universities offer both options. For example, Johnson and Wales University has a 15-month Online MS in Hospitality Management and an 18-month Online MBA in Hospitality. Talk to your mentors about which choice is right for you. How About Other Degree Titles? Along with the MBA and the MS in Hospitality Management, you’ll come across distance learning degrees with unusual titles. For instance, IUPUI has developed an Online MS in Recreation with a major in Recreation Administration. If you are working in a specific field (e.g. parks, casinos, golf courses, etc. ), shop around. General hospitality management doesn’t have to be your only choice. What is an Online Executive Program? Often offered by a College of Business, an executive program is an accelerated (i.e. quicker) master’s program designed for experienced professionals. To take just two examples, Roosevelt University has a one-year Online Executive Master of Hospitality and Tourism Management with five start dates. And the University of New Orleans has a one-year Online Executive MS in Hospitality and Tourism Management for students with three years of full-time work experience in a supervisory position in the industry. Check the admissions requirements—if you have a strong GPA and non-supervisory experience, you may still qualify. Are There Specific Prerequisites (e.g. GRE)? Even if you’re not interested in an Executive degree, you may still have to meet specific coursework & experience requirements before you can apply for an online master’s program. For instance, the College of Hotel Administration at the University of Nevada Las Vegas wants candidates for the Online Master of Hospitality Administration to have at least three years of industry experience at the management level. GRE and GMAT scores may or may not be required—policies vary widely between schools! Can You Transfer Credits Into the Online Program? Do you already have a graduate certificate in hospitality? Learn about transferring your credits. You can cut down on the time & cost of the degree. There will usually be a cap on the number of credits you can transfer. For example, the University of North Texas offers an allows students to transfer up to 12 credits in related coursework to its Online MS in Hospitality Management. Do You Need One? Unless you’re thinking of becoming a university professor, digging deep into hospitality research (e.g. new product development, management information systems, marketing and consumer behavior, etc. ), or really buffing up your résumé, you won’t need a PhD in Hospitality Management. Most hospitality professionals find that an MBA or MS has more practical applications. Can You Find One? They’re rare, but they do exist. For instance, Iowa State University has a Hybrid PhD in Foodservice and Lodging Management with two on-campus summer sessions. You may discover that a blended format is going to be your only choice. How Many Online Undergraduate Certificates Are There? A lot! In the field of hospitality, undergraduate certificates are a popular and cheaper alternative to the AAS degree. Plus, in addition to universities and community colleges, many technical institutes and vocational/trade schools are happy to offer online hospitality courses and certificates. Shop around. Can You Specialize at the Undergraduate Level? Yep. Even at this level, you can go beyond hospitality management to concentrate on a particular area of interest. For instance, UMass Amherst has Online Undergraduate Certificates in Meeting & Event Management and Casino Management and IUPUI has four Online Undergraduate Certificates in Sports Tourism Development, Tourism Planning & Development, Cultural Heritage Tourism, and Events Management. You’ll have plenty of choice! What is an Online Food & Beverage Management Certificate? Food & beverage management certificates are career-focused programs that include courses such as sanitation & safety, menu planning, nutrition, catering/restaurant management, and food purchasing. You’ll often see them being offered at the undergraduate level. What About Online Graduate Certificates? Online graduate certificates are a nice bonus when you’re applying for management positions; they can also set you up for a master’s degree later down the line. For instance, Missouri State University has an Online Graduate Certificate in Hospitality Administration that is custom-built for industry professionals who want to move up to mid- or upper-level management positions. Match the program to your level of expertise. Can You Transfer Your Online Certificate Credits? This rule applies to both undergraduate and graduate certificate programs. You never want to get stuck with unusable course credits. A lot of schools are happy to move certificate credits into their own degree programs. For instance, students at Colorado Mountain College have the option to apply credits from the Undergraduate Certificate in Hospitality Operations toward CMC’s AAS in Resort Management. Can You Enroll if You Live Out-Of-State? Most schools have reciprocity agreements (e.g. SARA) that make it simple for students from other states to enroll in online programs. However, you may find that your state is one of the exceptions to the rule! For example, under SARA, Missouri State Online is approved to offer online programs in 48 states excluding Massachusetts and California. Reciprocity issues may arise if the program includes on-the-ground components, so it’s always best to check. Does the Program Fit With Your Schedule? Schools are smart enough to realize that many hospitality students are working while they’re studying. That means online degrees and certificates often have multiple start dates, shorter terms, and asynchronous classes (i.e. there’s no need to log in at a certain hour). Having said that, you will probably need to block out time in your calendar for internships and field experiences. Graduate programs may also have on-campus summer sessions. What is the Credit Transfer Policy? Even if you don’t have credits for prior college coursework, you may be able to earn credits for previous work experience & training. Every university has its own quirky credit transfer policy, so you’ll have to spend a little time with the website. For example, students at Madison Area Technical College can earn up to 12 credits while working at Walt Disney World and participating in the Disney World College Program. Who is Teaching Your Online Course? There’s no excuse for programs with poor online professors, especially when it comes to a hands-on field such as hospitality management. Some schools feature their faculty on the program website, but you can also check the course schedule in the university catalog to find their names. Do they have a LinkedIn profile? Can you find reviews of their teaching? What do alumni say? We don’t mind adjunct professors if they’re currently working in the field. Is the Coursework & Training Relevant? For the money you’re laying down, you deserve practical coursework and plenty of real-world experience. Which hospitality companies sponsor the internships? Are you close to good internship sites? Does the curriculum incorporate case studies from the corporate world? What kind of training experiences can online students take advantage of? Spend a little time on the internships & careers page and be sure to ask the program coordinator about job placement rates after graduation. How Does the Program Support Online Students? Strong schools are going to have your back throughout the entire process (e.g. tutoring, tech help, counseling, career advice, etc.). For example, all students in Robert Morris University’s Online BSBA with a major in Hospitality and Tourism Management are assigned a coach & mentor. Meanwhile, UCF Career Services has developed online workshops and a virtual career center especially for distance learning students. Locate the student services section to see what’s on offer. Is the Program ACPHA-Accredited? You don’t need to go to an ACPHA-accredited school to get a great education, but it is one extra marker of quality that you may wish to consider. We talk more about it our Accreditation section (see below). Are There Hidden Costs? Read (and then re-read) the tuition & fees page before you sign on the dotted line. Universities and colleges often tack on fees for distance learning or technology. You may also be expected to pay for travel to internship sites, accommodation during any on-campus courses, and course materials. Budget for every expense. Is Financial Aid Available to Online Students? If it’s an online degree from a regionally accredited school, then the answer is usually “absolutely.” You should apply for the FAFSA as soon as possible. Online certificates, on the other hand, rarely qualify for federal and university financial aid packages. If you’re unsure about your options, check with the Office of Financial Aid for exact details and be sure to consider external funding (e.g. outside scholarships, employer reimbursement programs, etc.). Do Online Students Receive a Tuition Discount? Keep in mind that public and state universities often offer big tuition breaks to online undergraduates (and sometimes to graduates) who reside in the state or in neighboring states (e.g. University of Central Florida). Other universities will give tuition discounts to online students regardless of their location. For instance, the University of the Southwest does not charge out-of-state tuition or technology fees for online classes. Policies vary between schools, so visit the tuition & fees page for details. If you have any concerns about a school that is offering an online program in hospitality management, discover where the university is located and then have a look at our Online State Rankings. Under each state, we have a detailed list of Online Schools with Accreditation & Quality Concerns. The following universities appear in our rankings of Top Affordable Schools for Hospitality Management and Top Online Schools for Hospitality Management. That means they have met some extremely tough criteria for quality, flexibility, price, and use of financial aid money (you’ll see a CAG Score next to their profiles). CCU’s Online BSBA with a major in Hospitality, Resort and Tourism Management (HRTM) is administered by the Wall College of Business. But you’ll find tuition & fees for this program listed under Admissions & Aid. South Carolina residents receive a hefty discount on undergraduate tuition. As of 2018, in-state tuition rates for out-of-state students for distance learning courses were available only during the summer sessions. The Office of Financial Aid & Scholarships can assist with the FAFSA and applications for university funding (e.g. grants & scholarships). We should point out that the Department of Marketing and Hospitality, Resort and Tourism Management also offers a specific scholarship for marketing and HRTM majors. The School of Hospitality Leadership (SHL) is responsible for ECU’s Online BS in Hospitality Management (degree completion) and Online Graduate Certificate in Hospitality Management. And the SHL is part of the College of Business (CoB), which offers an Online MBA with the hospitality graduate certificate. ECU’s Cashier posts current tuition rates for online students. North Carolina residents get a substantial discount on tuition! The Office of Student Financial Aid is the place to go for aid. A small number of out-of-state tuition waivers are available on a competitive basis. Active-duty military stationed at a North Carolina base may also be eligible to receive in-state tuition rates for the MBA. See ECU’s Military section for more info on benefits. We should also point out that tons of College of Business scholarships are open to undergraduates (i.e. the BS in Hospitality Management) & graduates (i.e. the MBA). For example, if you search for hospitality management on ECUAWard, you’ll find a long list of opportunities (e.g. Bengel Family Scholarship, SHL Scholarship Pool, Aramark Scholarship, etc.). Graduate awards include ECU’s Gold, Pirate & Purple scholarships. IU Online has the scoop on IUPUI’s online undergraduate certificates and Online MS in Recreation. Each program page outlines tuition & fees: Indiana residents get a hefty tuition discount on the undergraduate certificates and a modest break on the MS. The Office of the Bursar has a tuition & fee estimator and the Office of Student Financial Services can assist with aid applications. See IU Online’s Costs & Financial Aid section for useful advice. Considering the Online MS? IUPUI’s Office of Student Scholarships has sections on both Graduate Student Scholarships and Military Scholarships. The Department of Recreation, Park, and Tourism Studies, which administers the master’s program, also has a handy section on Internships & Careers. ISU’s Hybrid PhD in Foodservice and Lodging Management is a blend of online courses and on-campus experiences during the summer. The Office of the Registrar has general info on tuition & fees, but you may wish to contact the PhD coordinator for details on travel expenses, accommodation, and fees for campus-based classes. Scholarships and teaching/research assistantships are only available for on-campus graduate students, but it’s worth noting that American Hotel and Lodging Educational Foundation (AHLEF) offers an assortment of scholarships. Missouri State Online has the lowdown on its Online BAS in Hospitality Leadership (degree completion) and Online Hospitality Administration Graduate Certificate, including details on careers & outcomes. MSU Online has a section on tuition & financial aid for online courses; the Office of the Registrar has similar details. In-state and out-of-state residents pay the same online tuition rate. Do you like the look of the Online BAS? Be sure to visit the websites on credit transfers and scholarships & financial aid for hospitality leadership students. Undergraduates are eligible for a variety of hospitality awards! You can apply for most of them through the General and Departmental Scholarship Application. The Office of Student Financial Aid will have further advice on aid packages. UCF Online can fill you in on its Online or Hybrid MS in Hospitality and Tourism Management. Estimated tuition & fees are listed on the program website, but they’re spelled out in more detail in UCF’s section on online graduate tuition & fees. Online students receive a waiver for some campus-based fees. Overall, Florida residents pay much less than out-of-state residents! The Office of Financial Assistance can help with federal loan applications and the College of Hospitality and Management has some info on hospitality scholarships. Also, be sure to check out UCF’s Scholarships A2O for details on more general university scholarships. Details on tuition & aid for UMass Amherst’s Online BS Hospitality & Tourism Management (degree completion) are posted by the Isenberg School of Management. The cost is the same for all students: in-state, out-of-state, and international. A one-time university fee and a per semester registration fee will apply. Looking for aid options? The Office of Financial Aid Services has specific advice for continuing education students. More than $450,000 in scholarship money is awarded to management students on an annual basis through the Isenberg Undergraduate Scholarship Program. Students use one common application for all Isenberg Scholarships. Talk to UMass’s online undergraduate advisors if you have any questions about applying for the program. UNT Online has the rundown on its distance learning programs, including the Online MS in Hospitality Management. Tuition costs, as well as tips on applying for financial aid, can be found on the program website. Texas residents receive a sizeable tuition discount! Visit the Office of Student Financial Aid & Scholarshps for more assistance. All applicants to the College of Merchandising, Hospitality & Tourism (CHMT) have the opportunity to apply for competitive academic scholarships through UNT’s General Scholarship Application. UW-Stout’s Online BS in Hotel, Restaurant and Tourism Management and Online BS in Golf Enterprise Management (GEM) fall under the auspices of the School of Hospitality Leadership. However, each program website has details on tuition costs and credit transfers, including applying for transfer, transferring credits, and articulation agreements. Per credit tuition rates are the same for in-state and out-of-state online students. The Financial Aid Office can provide advice on aid packages. Don’t forget to look over UW Stout’s general scholarships and Stout Foundation scholarships (e.g. Mark Zipperer Pride Hospitality Scholarship) to see if you qualify. Remember, too, that Madison Area Technical College has a special agreement with UW-Stout that allows students to apply hospitality management credits from the Online AAS in in Hospitality Management toward the bachelor’s degree. Whether you’re thinking about an online certificate or a degree, we recommend that you opt for a school that holds regional accreditation. Regional accreditation is given to a institution—not an individual department or program—so it will cover online offerings. Why do we keep hammering on about this? Because earning an online qualification from a regionally accredited university or college will make it easier for you to transfer credits; qualify for federal aid; apply for student loans, scholarships, and tuition reimbursement; and gain acceptance into graduate programs. Many regionally accredited schools will not accept credits from nationally accredited schools. AACSB is often considered to be the gold standard. We take a closer look at these in our guide to Affordable MBA Programs. Schools with online hospitality programs can hold ACPHA accreditation (e.g. UW Stout’s Online BS in Hotel, Restaurant and Tourism Management, Northern Arizona University’s Online BS in Hotel and Restaurant Management, etc.). You do not need to attend an ACPHA program to qualify for federal financial aid. But accreditation it is a marker of quality. The American Hotel & Lodging Educational Institute (AHLEI) is a well-known organization in the hospitality industry, and it offers a variety of voluntary certifications for hospitality professionals. Certified Hospitality & Tourism Management Professional (CHTMP): Available to high school students who complete the 2-year Hospitality and Tourism Management Program (HTMP). Certified Hotel Administrator (CHA): For hotel general managers and hospitality executives. Plus many, many more! Check each certification description for prerequisites. You may not need any degree (online or on-campus) to qualify for the exam. For example, CHA candidates need to have two years of work experience, but there’s no specific education requirement. Want to go beyond AHLEI? We provide a checklist of other hospitality certification organizations in our guide to Affordable Hospitality Management Degrees.